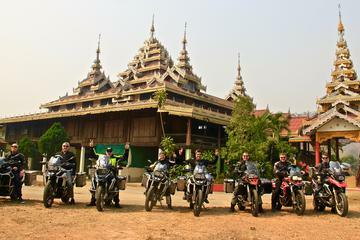 Calling all BMW enthusiasts, how would you like to travel Thailand by Motorcycle? According to a friend of mine, BMW is the only way to go. That's because my friend is BMW crazy and has not one but two branded bikes and a BMW 1.35i motor car. Best to leave it at that. Though I have owned a BMW myself, it matters not what bike you choose to ride, travelling by bike in Thailand is a great way to see the real beauty of this country. However, you need to take all the necessary precautions as not everyone here has their eye on the road. 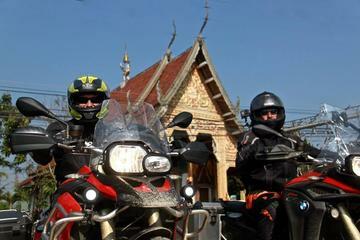 A great way to travel Thailand by motorcycle and to meet other like-minded bikers is to join up with a motorcycle tour. 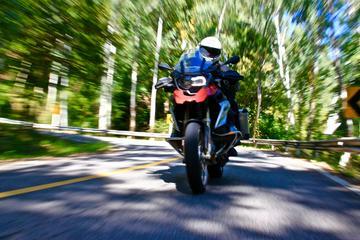 I have partnered with a tour company offering you a few motorcycle exploration options. Below you'll find several guided and self-guided tours in which to choose. And with that, I wish you all a safe and pleasant journey. 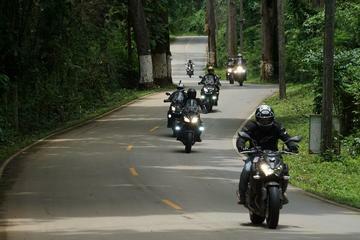 This 1-day BMW self-guided motorcycle tour will certainly introduce you to some of the many attractions near Chiang Mai while also providing you with an enjoyable riding experience on some scenic and twisty roads. You'll get an opportunity to stop at the impressive waterfalls of Vachiratarnand before continuing to the top of Doi Inthanon, which at 2,565 meters, is the highest mountain in Thailand. Along the way, you'll also see the impressive Twin Pagodas and a genuine Hmong Tribal Market. Sound good to you? This comprehensive tour through Northern Thailand gives you a great insight of the land of the Lanna Kingdom - the "Kingdom of a Million Rice Fields". After setting off from Chiang Mai, we will ride the winding road up to Doi Inthanon, the highest mountain in Thailand. On this Thailand by motorcycle tour you'll get to visit the Long Neck women and ride up to the border of Myanmar to visit Ban Rak Thai, a Chinese community. Along the way, you'll also visit some of the lesser-known treasures like Misty Mae Hong Son, as well as the mysterious town of Nan and the unique village of Bo Kluea with its salt wells. We'll also drive to other famous and infamous places like the Golden Triangle and the small laid-back city of Chiang Rai, home to the stunning artwork of the white temple known as Wat Rong Khun. This tour provides an outstanding opportunity to obtain a thorough impression of a large part of Northern Thailand. Between Mae Hong Son and Mae Taeng, there are 1,864 bends which could give you a great opportunity to improve your cornering skills no matter what level of expertise you have. We explore some of the lesser-known treasures of northern Thailand and some famous cultural sites like Thailand's first capital city, Sukhothai, a UNESCO World Heritage Site. Among the highlights of the trip, we'll visit the highest mountain in Thailand known as Doi Inthanon. We'll visit the Long Neck women of the Kayan Tribe. We'll explore the Golden Triangle and the remote and mountainous province of Nan. At Mae Sot, we cross-over by foot into Myanmar and visit the town of Myawaddy, one of the key cross-border trading centres. If you have the time, this is a tour not to be missed. This 3-Day small-group motorcycle tour will take you from Chiang Mai to Doi Inthanon, Mae Hong Son, Ban Rak Thai, Pai and Mae Sa. Your journey along the Mae Hong Son Loop cuts through some of northern Thailand's most spectacular scenery. The route is famous for having 1,864 bends along its approximately 650 kilometres (400 miles). See Doi Inthanon which at 2,565 meters, is Thailand's highest mountain. Visit a village of the Long Neck Karen Tribe, a hybrid Chinese-Burmese border town on a lake and Pai the small town that became famous after a romantic Thai movie. Your tour includes A pickup and drop-off in Chiang Mai as well as daily meals and overnight accommodation in Mae Hong Son and Pai. You're going to love this. The Mae Hong Son Loop is a comprehensive way to discover one of Thailand’s most authentic provinces. 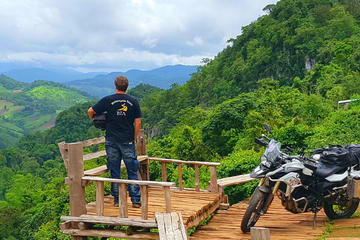 If you want to see the real Thailand and want to ride in a biker's paradise, the Mae Hong Son Loop would be the perfect antidote for you. Mae Hong Son is the most mountainous province in Thailand and receives very little traffic due to its relatively remote location and the time needed to reach it.